I’m not perfect at it, but it doesn’t matter because I get to feel so much more LOVE. I’m focused on it every day. I get to experience more happiness, more peace, more understanding of myself and of others, more joy, and of course more LOVE. It’s a much more beautiful way to go through life. It’s as if I was looking at life out of some funky kind of colored glasses before, and all the sudden I realized I could trade them in for rosy ones. It’s true that the feeling of LOVE is available to everyone all the time. You, me and even your crabby next door neighbor. Ask yourself what you want to create in your life at this moment in time. Then ask yourself what’s the emotion you’ll want generate to make this thing happen? Is it COURAGE so that you can start that business you have been dreaming of? Is it SELF-COMPASSION to stop buffering with the over-busying, over-drinking, over-eating, over-netflixing, over-shopping, or whatever your choice of over-doing is? Is it DETERMINATION to finish that book you want to write? When you’re taking action on your goals, some of the best feelings you can use to get there are determined, confidence, energized and competence. And wo-man do those emotions feel good to have. For example, I am determined to feel LOVE in my life. I am confident that it’s possible to feel LOVE every day of my life because I believe in the power of unconditional love in its most selfish form. I feel energized by the idea of feeling so much LOVE. I feel competent that I know how to create the thoughts that will generate the feelings of LOVE in my life. No one or thing in my life needs to change for me to feel LOVE because it’s an INSIDE job. People don’t need to be kinder to me, my life doesn’t need to change in anyway to be more perfectly aligned with how I imagine it “should” be. I can generate LOVE right now at this very moment. You too have the power to generate any emotion that you wish to feel. AND your outside circumstances don’t need to be perfect or amazing in order to feel whatever it is that you wish to feel. Think about what it is that you want to create in your life. Then decide which emotion you will need to create it? What does the emotion feel like? What do you need to be thinking in order to feel this? NOTE: Remember that your thoughts create your feelings, NOT the outside circumstances of your life, even if it feels that way. AND this is the absolute best news ever! How can you commit to feeling this way today? And the next day and the next? I suggest you try on an emotion for at least an entire month. How will you act when you feel this way? How can you get back on the right path if you notice you are not generating the emotion that you want? Start with one emotion and practice it daily. If it’s being excited, feel excited. Look for things to be excited about. Think exciting thoughts. Act excited. Create exciting things. And stay committed to the emotion. My life doesn’t have to be perfect to feel LOVE. And your outer circumstances don’t need to be perfect either for you to start feeling and creating the emotion you want to feel. And it can be delicious and wonderful even when it feels hard or challenging. That’s life. It’s not perfect and it never will be. 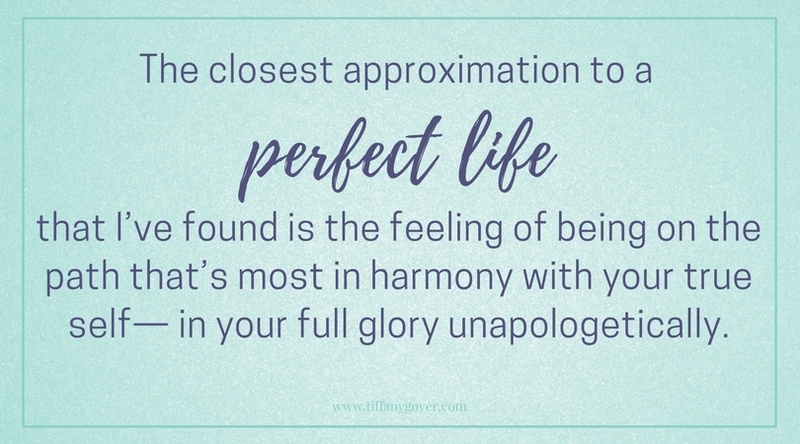 The closest approximation to a perfect life that I’ve found is the feeling of being on the path that’s most in harmony with your true self— in your full glory unapologetically. Don't aim for perfect, aim for that. And know that at this exact moment no matter what’s going on in your life, you can use the skill of generating emotions to get there. Enjoy this process, cultivate it. You will not regret it and you have all the power within you to do this right now. It’s my birthday tomorrow and I plan to feel love all weekend. What will you be feeling? I’d love to hear what emotion you are going to practice. Comment below to let me know. Good luck. You got this. If ever you need some guidance just let me know. I’m here.